Includes start and end times for each day. User must fill in start date, hourly rates for all hour types, start and end times, and hours categorized as regular, overtime, sick, vacation and other. A pie chart is automatically rendered as a visual breakdown of regular hours, overtime hours, and PTO hours over the course of the weeks. 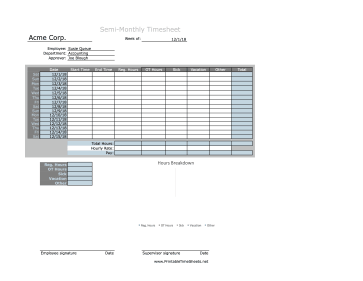 This Time Sheet is available in two versions: a free, ready-to-use version and a $9.00 spreadsheet version. The free version is available in Acrobat (.PDF) format: just download one, open it in Acrobat (or another program that can display the PDF file format,) and print. This version does not perform calculations for you. The $9 version is in a spreadsheet that automatically performs the calculations for you. It is compatible with Microsoft Excel, Google Docs, and any other spreadsheet app that's compatible with the Excel .XLS format. The spreadsheet version can be customized with your company name, employee name, hourly wage, etc. You can pay using your PayPal account or credit card. You'll be able to download the customizable timesheet within moments. If you don't see a timesheet design or category that you want, please take a moment to put your suggestion in our suggestion box.